QUESTION: Do you score every round? Do you score numerically? Do you use a standard scoring system, (i.e., is an 80 in Palm Beach equal to an 80 at a local schooling show) or do you use a sliding scale? The all-important score. Our judges share their scoring systems; how the scoring is calculated during the class and how the final order of placing emerges. 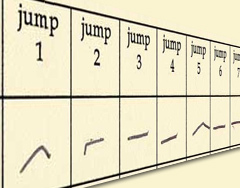 Some judges standardize their scores, while others score relative to the class performances. Our judges share their thoughts on the “80 in Palm Beach” performance as compared to the “80 at a local schooling show” round.